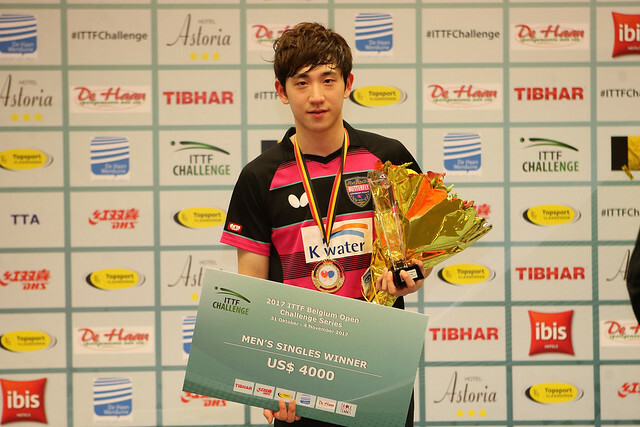 Success by narrow margins; never has Puerto Rico’s Daniel Gonzalez gained first place in a group by a narrower margin than that achieved on Wednesday 1st November at the 2017 ITTF Challenge Belgium Open in De Haan. On the opening day of play he had experienced defeat in six games when facing the Czech Republic’s Patrik Klos (11-8, 11-7, 8-11, 6-11, 11-8, 11-7); on his next visit to the table by a similar margin Patrik Klos was beaten by Bulgaria’s Petko Gabrovski, the highest rated player in the group (11-8, 11-7, 8-11, 6-11, 11-8, 11-7). Six games contests; on the second day of action, the margin of the result was just the same but against the odds. Daniel Gonzalez accounted for Petko Gabrovski (7-11, 11-4, 11-5, 11-9, 8-11, 11-9). The outcome was that points ratio was needed to decide the final order and that proved the crucial factor. The difference in points when the three players were considered was exactly the same between Daniel Gonzalez (108:106) and Patrik Klos (109:107) but when ratio was considered, the points lost are divided into points won, the verdict was determined by the fourth decimal point! Thus it was first place for Daniel Gonzalez (1.0188), second place for Patrik Klos (1.086) with Petko Gabrovski in third place (107:111) in ratio terms missing out by a whisker (0.9639). Disappointment for Bulgaria; there was further disappointment for the eastern European country. Both Kiril Popov and Stanislav Golovanov who started proceedings as the highest rated players in their respective groups experienced defeats. Both suffered at the hands of France. Kirill Popov was beaten by Frenchman Leo de Nodrest (7-11, 6-11, 11-7, 12-10, 11-6, 15-13), Stansilav Golovanov suffered at the hands of Jules Rolland (11-8, 11-5, 11-5, 5-11, 11-7).